Like so many #avgeeks, I have just returned home to reality from the World’s Largest Aviation Celebration. ‘Oshkosh’ week is such a huge part of my life, and while it becomes a tiny bit more strenuous every year, despite the miles, there are endless smiles. A is of course for AIRPLANES, as far as the eye can see. I especially enjoyed getting lost in nostalgia over in Vintage this year, drooling pools over the Travel Airs from the American Barnstormers Tour and the beautiful Howard DGAs. But when you come into the grounds in the morning on the dorms bus and see the North 40 full of airplanes and tents, there is no better sight in all of aviation. The magnitude of Oshkosh is on display, it is truly the family reunion of the GA world. B is for BACON, a constant theme these days for me at Oshkosh. From the 72 bags of Bacon Jerky that were devoured in an hour at my Tuesday night social media meet up, to the lovely #avgeeks over in Camp Bacon, you just cannot get enough bacon at this show. Despite this theme, the Chow Hall at the UW dorms never served bacon once while I was there. Just how many ways CAN you cook sausage? The Blackhawk Commons Lunch Ladies have it figured out apparently. 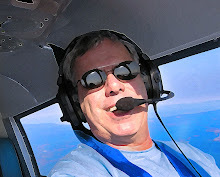 C is for CAMARADERIE, the warm, fuzzy feeling of being surrounded by about 600,000 of your closest airplane BFFs. From the moment you get on the bus at the dorms to ride to the show, to later at night walking back from that bus, you meet new friends from all over the world. I especially enjoyed seeing all my Twitter pals again for our annual meet-up/chatfest. D is for DIAMOND DA62, the luscious diesel twin that I reported about live from the show in this First Impression piece. 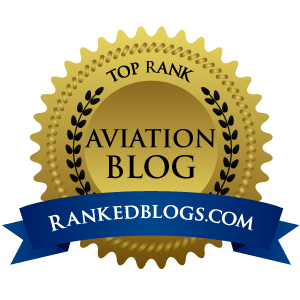 While $1.4 million seems out of reach, I think the airplane is actually an exceptional value when you look at the performance and safety the DA62 delivers. And who can argue with diesel engines that start like a car and sips 5.9 GPH per side in cruise with up to seven people on board? Amazing engineering, the DA62 is my new dream airplane. E is for EDSEL FORD, the main spokesman for Ford Motor Company at the show. When I came out of my Tuesday appearance on EAA Radio, he was waiting to go into the studio. I thanked him for being such a huge sponsor of EAA, and he graciously accepted. I wanted very much to ask him about the Ford Burnout Show they had set up this year and how an original Edsel would have fared against the monster Mustangs lightin' ‘em up. F is for FIGHTER JETS, they were plentiful at Oshkosh this year. While the daily sight of my tax dollars being converted into jet noise was awesome, nothing prepared me for the surprise visit by the Blue Angels. I was sitting in the Media Workroom on the south end like I always do, so I can watch the sky for anything interesting to fly by. Other journalists were nearby, all of us buried in our computers. We all felt the rumble, which quickly escalated to a loud roar. The unmistakable explosion of sound that comes out of the formation of fighter jets was heard next, with the actual Blue Angels passing over the show low and fast, west to east. To say we were blown away is an understatement. I believe I might have said a bad word, something that starts with “F” and ends with “K” and is not “firetruck.” Apparently the Blues were en route to Fargo, ND for a show, and thought it would be fun to hang a left and buzz Oshkosh. G is for GRAVY, which happened to jump onto my morning hash browns over in the UW chow hall for the dorms where I stayed. Great place to get in, chow down with some seriously adequate food, and hop on the bus to get to the show. Nothing fancy about the dorms chow hall, the food is not memorable but not bad either. The Pacific Northwest contingent present did however deduct a star from their Yelp review for those cute widdle 8-ounce styro coffee cups. Took three of them to get me going each morning. Have they not heard of Big Gulps? Coulda used a quad non-fat Vanilla Latte, that would have lit my afterburners! H is for HISTORY, which was everywhere this year. From the RAF 100th anniversary to the large gathering of warbirds to the endless rows of beautiful restored ships in Vintage, it is clear with every step you take at Oshkosh that EAA membership is working hard to keep aviation history alive for the next generations to enjoy. I is for IDIOT, like the one dude I met on the dorms bus one evening. When I asked how his show was going, he growled “horrible, can’t wait to get home.” Really? In all my years of coming to Oshkosh, this was a first. You have to be a classic idiot to not enjoy yourself at this show. J is for JEN_NIFFER, one of my favorite #Avgeeks I see at Oshkosh. She helped me with #Oshbash in numerous ways, and her “Fun Meter” is pegged very far into the red way past the “fun” zone. While not a pilot, she is one of the most passionate people I know when it comes to aviation. The marketing people at the medium-sized Midwestern airport where she works as an accountant would be well served to just transfer her onto their team. Their meetings would have to take place on the roof of the parking garage so Jen could spot planes all day every day. Her Tales From the Terminal Blog has some great reporting from the show. K is for KICKASS, because this show always is. L is for LARRY OVERSTREET, the Supreme Overlord and Mayor of Camp Bacon. Not only is he one of the nicest dudes on this planet, the work he does each year to make sure we all get the “Camp Bacon Experience” needs to be applauded. Nice job as always, Larry (as well as all those who helped him). M is for MATT GJEDDE, who was kind enough to pick me up at Appleton Airport in his rental car and drive me to Ardy and Ed’s for my celebratory first Oshkosh meal. Straight up good dude, smart as can be, exceptional character. And he’s the only person I know that can rattle off every plastic part on a John Deere riding lawnmower from memory. N is for NOOBS, the kind I love to help as they navigate this massive event for the first time. I am always on the lookout for people who look confused, and I can usually offer some welcome advice that answers their many questions. Piece of Advice #1 is always to learn the Tram routes first thing on the first day, because when it's 99 degrees and humid in the afternoon, the Trams are the slick way to get from "A" to "B" without killing yourself. O is for “OMG” because that’s what I found myself saying quite a bit this year. From the Bally Bomber (single-seat experimental replica of a B-17) to the B-1 bomber, to 1,001 other things that made for great “Oshkosh moments” this show did not disappoint. P is for PILATUS, who had their shiny new PC-24 on display. Of course all the doors were roped off, so the only way to get inside was with a sales appointment. I was sliding past the -24 one day and saw nobody in line. So I flashed my media badge and asked the Pilatus guy working the rope like a Bouncer if I could just peek inside for 30 seconds, you know…because, media. He was somewhat friendly when he pointed to the tent and told me to make an appointment. Not the usual good vibes I get from most exhibitors at this show. Q is for QUALITY to describe the exhibitors at this show. Since I am not an airplane owner right now, I did not need to shop for stuff. But I am always amazed at how the entire industry brings out their best for Oshkosh. If it’s new, innovative or disruptive, it’s found here. R is for RADIAL ENGINES, which were in abundance at Oshkosh, same as always. I never grow tired of that sound. If there was a symphony of airplane noises, a big, fire-belching radial engine would be playing first chair. S is for SEAN D. TUCKER, who again flew flawless shows in his Oracle Challenger. I heard this is his last season as a solo act, and he is putting together a formation act. Tucker is one classy dude, he understands that what he does is for the fans, but he also gives back to aviation in big ways. He’s also so fit, trim and athletic, it is kinda unfair to the rest of us. T is for TWINS, as in Brandi Fill and her identical twin sister Shimmi. I saw David Fill pushing the family stroller, and proceeded to strike up a chat with his wife Brandi standing next to him. After saying a bit, Shimmi pointed behind me and said “Brandi.” Sure enough, I had them mixed up, not hard to do as they are really, really identical. Always great to see the Fills make the long highway trek from the East Coast. It takes a lot of dedication to do a show this massive with three very young children. V is for VEGETABLES, the kind I like on my burger. I finally cracked the code to order a Drive-in Double at Ardy and Ed’s with the works, lettuce, tomatoes, onions and pickles. Tried this the last couple of years and never saw any produce between my buns. This year I scored and man, what a meal. Enjoyed it with Matt Gjedde, his first time there. I got the burger (which also has a slab of bratwurst), fries (with tartar sauce as recommended by the car hop on roller skates), and of course the obligatory large Black Cow. Matt just said "I'll have what he's having," and he was a happy camper. W is for WONDERLAND because this show is so much more than anyone who has not seen it in person can possibly imagine. Your jaw drops so much, it gets kicked around by your shoes, and that’s just by Monday at noon. For us #avgeeks, it is truly a wonderland of sights and sounds, family and friends. X is for XP-82 TWIN MUSTANG, the one that could not make the show after all. I think it was on everyone’s wish list of “must see” airplanes, and seeing (and hearing) it fly would have been so cool. But I understand this restoration must be incredibly complex, and it was not meant to be. 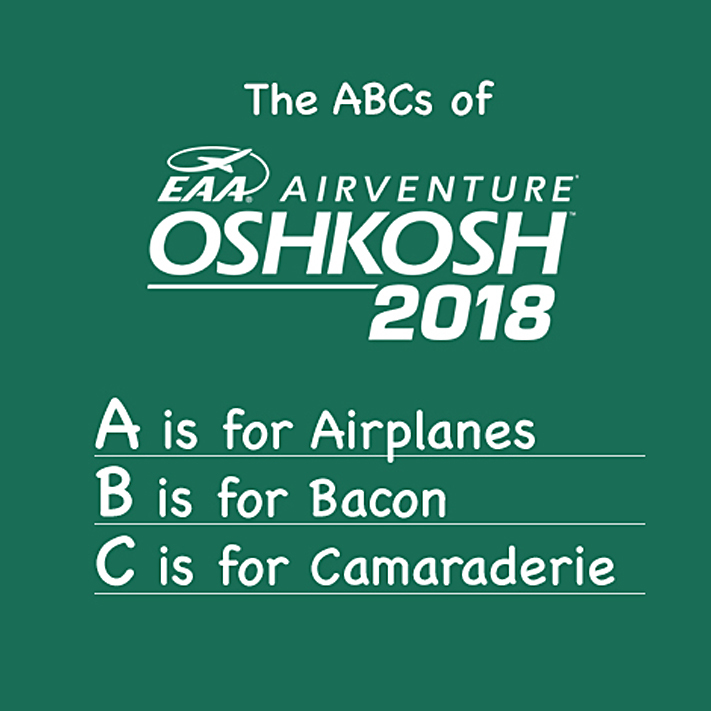 Maybe #OSH19? Y is for YAK 110, the Frankenplane that was created for the air show circuit by welding a pair of Yak 55s together, and strapping a jet engine on the wing center section. I saw Jeff Boerboon pilot what I call “Yakkity Yak” on Weds, and it was mind-blowing. Lots of noise, smoke, speed, aerobatics - everything you want in an air show act. It was freaky to see it fly, kind of looked like two Yaks flying in VERY close formation. Z is for Generation ZULU, the generation of future pilots coming up after Millennials. They were thick over in Aviation Gateway Park and it was clear many of them were trolling for jobs. Good…we need every one that can get his or her licenses and ratings, ASAP would be grand.